We have manufactured bonding straps and retaining cords for the aviation industry for almost 20 years. 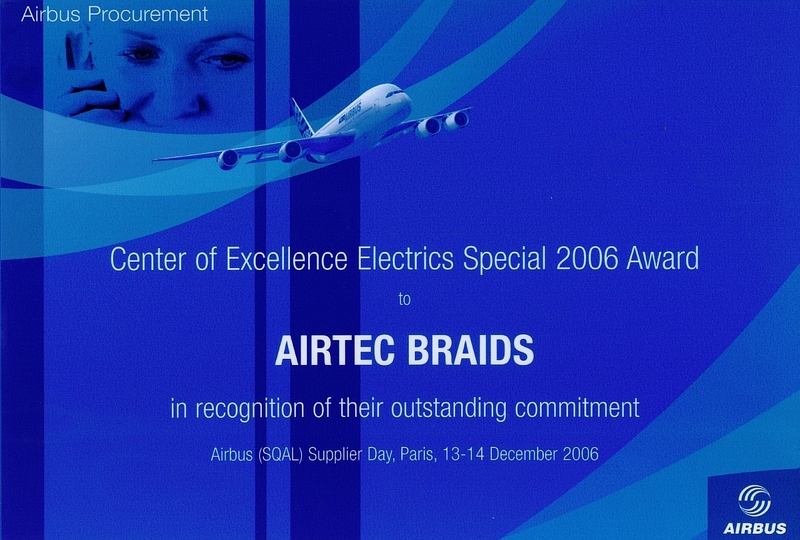 Our many years of experience in this field and our uncompromising customer focus make AIRTEC-BRAIDS GmbH the aviation industry’s preferred partner. Our mission is to cement and further build on this position. We can only achieve this if our customers are satisfied at all times. For this reason, ensuring lasting customer satisfaction and creating business relationships built on trust are the key objectives of our company. We therefore make it our top priority to guarantee that our products and services are of a high quality and are always working to make improvements. Our quality standards are set by our customers. When it comes to our products and services, the opinion of our customers is the only thing that matters and this is what determines our company’s quality and performance standards. Acceptable quality means “no faults” or “100% correct”. Our customers’ queries, quotes, complaints and any other requests are always dealt with immediately by the relevant staff. Our policy is to provide an initial response on the same day if possible and at the latest within 24 hours. In order to meet our customers’ high requirements, we work with a quality management system that is based on the standard DIN EN 9100 and is audited every year. We guarantee verifiable, documented quality for our customers.